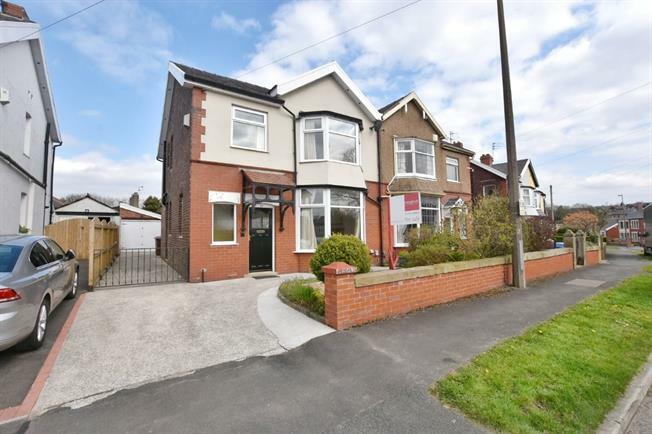 3 Bedroom Semi Detached House For Sale in Blackburn for Asking Price £195,000. This stunning property is immaculately presented throughout, with a great contrast between the traditional family home that it is with a modern twist. The home comprises an entrance porch, spacious hallway, large receptions rooms at the front and rear, conservatory and a modern kitchen. Upstairs there are two large double bedrooms, a good size single bedroom, a recently installed family bathroom and a separate WC. Wooden double glazed front door, opening onto the garden. Double glazed uPVC window with opaque glass facing the front. Tiled flooring and ceiling light. Double glazed uPVC window facing the side. Radiator, tiled flooring and ceiling light. Double glazed uPVC bay window facing the front. Radiator and open fire with feature fireplace, original floorboards, chimney breast, original coving and ceiling light. Radiator and gas fire, carpeted flooring, chimney breast, original coving and ceiling light. UPVC double glazed double doors opening onto the garden. Double glazed uPVC window facing the rear. Radiator, tiled flooring, wall lights and ceiling light. UPVC double glazed side door opening onto the driveway. Double glazed uPVC window facing the rear overlooking the garden. Tiled flooring, under stair storage, spotlights. Roll edge work surface, built-in wall and base units, stainless steel circular sink, freestanding oven, over hob extractor, space for washing machine and fridge/freezer. Double bedroom; double glazed uPVC bay window facing the front. Radiator, carpeted flooring, a built-in wardrobe and ceiling light. Double bedroom; double glazed uPVC window facing the rear. Radiator, carpeted flooring and ceiling light. Double glazed uPVC window facing the rear. Heated towel rail, vinyl flooring, tiled walls and spotlights. Corner bath with mixer tap, double enclosure shower, vanity unit and top-mounted sink. Double glazed uPVC window facing the side. Vinyl flooring, part tiled walls, ceiling light. Standard WC.